HIEROGLYPH was created by Travis Beacham, and was set to be showrun by BEING HUMAN’s Anna Fricke. Personally, I was intrigued by the trailer for the series, so I’m a bit bummed the show never got a chance. 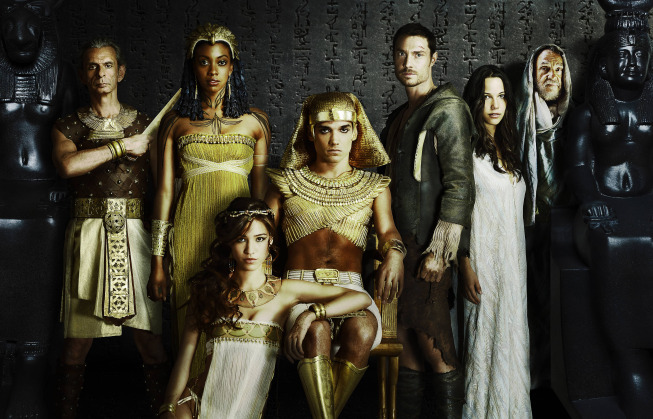 Fox is bringing an ambitious series to our screens in 2015 with HIEROGLYPH, as the network explores ancient Egypt. HIEROGLYPH: The world of ancient Egypt - a time of magic, Pharaohs, gods and thieves - lives again in HIEROGLYPH, an exciting action-adventure series from creator/executive producer Travis Beacham ("Pacific Rim,""Clash of the Titans"). The epic fantasy follows a notorious thief who is plucked from prison to serve the Pharoah, forcing him to navigate palace intrigue, seductive concubines, criminal underbellies and divine sorcerers, as he races to stop the downfall of one of history’s greatest civilizations. HIEROGLYPH will join the schedule in 2015 on FOX. Pictured L-R: Antony Bunsee, Condola Rashad, Kelsey Chow (sitting) Reece Ritchie, Max Brown, Caroline Ford and John Rhyse-Davies. © 2014 Fox Broadcasting Co CR: Jacob Lewis/FOX. Fox has given a 13-episode order to another new series. This time, it goes to HIEROGLYPH, a show the network is dubbing “a fantastical action-adventure.” Production is scheduled to begin in early 2014. Are you intrigued by this new show?